Walt Disney had much success with the two action/adventure/fantasy films he had previously made, 20,000 Leagues Under the Sea and Swiss Family Robinson. It is not surprising that the source material for his third would also stem from the mind of Jules Vern, who wrote 20,000 Leagus. Inspired by one of his lesser known novels, Captain Grant's Children, In Search of the Castaways is a big budget, star studded film designed to be the next big hit from the master of family entertainment. One of Walt's best directors, Robert Stevenson, was put in charge of the picture. Part of the reason Walt was attracted to the story was that it had a part for a teenage girl and he was looking for something different for one of his favorite stars, Hayley Mills. Internationally famous Maurice Chavalier was cast in his first of several Disney films. Keith Hampshire, who plays Hayley Mill's brother, was personally discovered by Walt when he saw him in the lead role in a London production of Oliver while on vacation. This was the only live action Disney film for George Sanders, but he did return to the studio as the voice of Sher Khan in The Jungle Book. Much of the film was made indoors at Pinewood Studios in England. Syd Pearson and Peter Ellenshaw lead the special effects team. 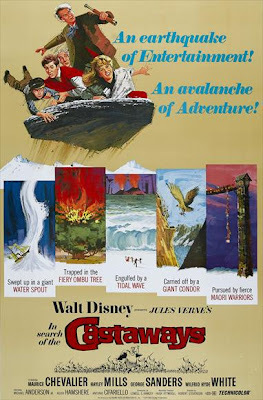 The Sherman Brothers wrote four songs for the film: "Merci Beaucoup," "Grimpons," "Enjoy It" and "The Castaways Theme." The film opens with footage of a message in a bottle at sea while the credits play. The story takes place in 1858 and starts in Glasgow. Mary and Robert Grant show up at a yacht with Jacques Paganal, a geography professor, to alert Lord Glanarvan that their father who was lost at sea on one of his ships is actually alive, as evidenced by the message in a bottle they received. He doesn't believe the story, but Mary convinces his son John to persuade Lord Glanarvan to change course to South America to find him. Once in the snowy mountains of South America, an earthquake dislodges the cliff they are camping on, sending them sliding down a mountainside and into icy caverns below. Robert gets thrown off a cliff during the ride and is rescued by a giant condor. A local Indian shoots down the condor before it can take Robert to its nest to feed its babies. He knows of the tribe that held their father captive and has heard that he was sold off to andother tribe in the Pampas. He leads them there and along the way, they stop for the night in a giant tree. A flood strands them in the tree for several days and a jaguar ends up in it too. Lightning strikes and the tree catches on fire, followed by a tornado which uproots the tree and turns it into a raft until they are rescued by their Indian guide. He takes them to the village where they discover that their father was never one of their prisoners. Jacques remembers that the shark in which he found the message is native to Australia so they head there. A man named Thomas Ayerton claims that Captain Grant has been captured by the Maori tribe. Mary and John discover a little too late that Thomas lied to them to use their ship for a gun run. It turns out, Thomas was on Captain Grant's ship and sent him overboard in a life boat the way he sends them off the ship. They are taken captive by the Maoris and imprisoned, where they meet one of Captain Grant's crewmen Bill Gaye. He is particularly delighted to meet Robert, who is small enough to fit through a gap in their prison cell. That night they escape and are chased through the mountains by their captors. They hide in a safe spot as the volcanic mountain erupts and scares the Maoris away. They take back their ship and Captain Grant, who is happily reunited with his kids. In Search of the Castaways had its world premier in London on November 14th, 1962 and entered wide release in the US on December 19th, 1962. Critics were fairly mixed about it, noting that while the film had plenty of adventure and a good pace, there wasn't much substance to it and it didn't live up to what audiences expected from Disney. It was a big success at the box office and audiences loved it, particularly young children. It was rereleased twice in theaters in 1970 and 1978. It made its TV debut later in 1978 and was released on home video in 1984. I never saw this film as a kid, but I imagine I would have loved it if I had. It rides high on entertainment value, with an exciting plot that never gets boring and plenty of twists and turns along the way. The cast is great in their roles, especially Hayley Mills and Maurice Chevalier. And two of the songs, "Enjoy It" and "The Castaway Theme," are sure to get stuck in your head. Surprisingly, the one area this film falters on is special effects. While the ride down a broken cliff is a fun scene, close up shots are obviously filmed in front of a moving screen and long shots are some of the worst use of models I've seen in a film from the 1960's. The giant condor is also completely unconvincing and almost laughable. However, you can't fault the filmmakers for having an imagination that effects technology hadn't caught up to yet. Not all of the effects are bad though. Peter Ellenshaw's matte paintings are pretty dazzling and the volcano scene is impressive, especially when considering that it was shot indoors! It's only when you compare this film to 20,000 Leagues Under the Sea or Swiss Family Robinson that you realize the studio could have, and had, done better. But it's a thoroughly enjoyable adventure/fantasy film in its own right. In Search of the Castaways is currently available on DVD. The film is presented in fullscreen, but it was originally presented in a widescreen aspect ratio of 1.75:1. A minimal restoration was done, but the print features many flaws and lesser known films from the era look far better on their releases. It is also surprising that there are no bonus features for a film with this amount of star power and special effects. The film is available on iTunes, where it is presented in widescreen and in HD.